CT1102-1 is a very versatile dense ceramic coating consisting of Aluminum Oxide with the addition of small quantities of Titanium Oxide and other oxides, which act to toughen the coating structure. The coating is hard and very wear and heat resistant. It will resist molten aluminum, zinc and copper and is also used to resist cavitation in fluid handling devices. These coatings are chemically very stable and are used in a wide range of corrosives. Properly sealed, they will resist most industrial chemical environments. 2,000 - 4,000 psi avg. Aerospace applications include a fairly wide range of wear coatings – especially seal teeth. 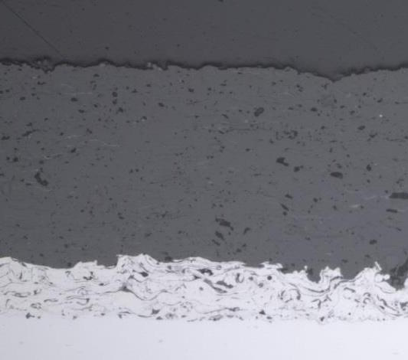 This coating is used over a bond coat of Nickel Aluminum, or Nickel Chrome Aluminum to produce a hard, dense, wear resistant layer that resists abrasion extremely well. CT1102-1 is also used on pump sleeves to protect against wear and cavitation as well as chemical attack. The coating should be sealed for service in severe chemical environments. CT1102-1 should not be used in Ammonium Hydroxide, Ammonium Phosphate, Hydrofluoric acid, Hydrogen Fluoride or Picric acid. Finish CT1102-1 by grinding wet or dry with silicon carbide or diamond wheels. Finishes of 20-30Ra may be achieved by standard grinding techniques and 5-10Ra finishes can be achieved by superfinishing techniques.